The rise of fracking has reshaped the global energy landscape. It recently hit a new milestone in the U.S. Fracking now accounts for more than half of all U.S. oil output, according to the Energy Information Administration. It's a stunning feat considering fracking made up less than 2% of American oil production in 2000. Hydraulic fracturing technology, more commonly known as "fracking," paved the way for drilling into America's enormous shale deposits. It has fueled a dramatic boom in U.S. oil production. Back in 2000, there were just 23,000 fracking wells pumping about 102,000 barrels of oil a day. 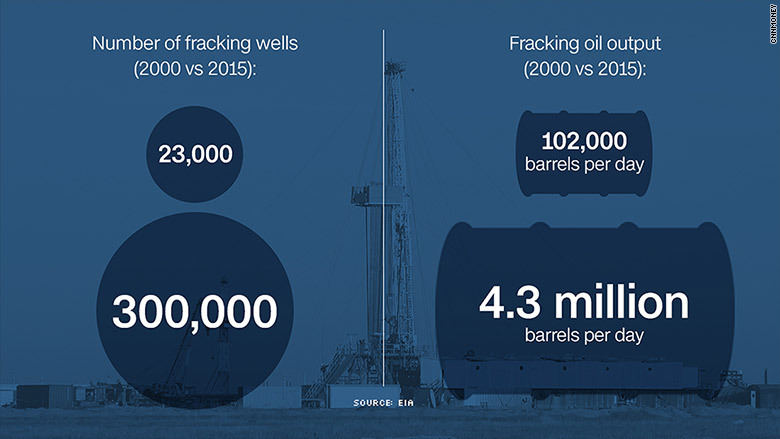 Now there are 300,000 fracking wells, churning out 4.3 million barrels per day. Fracking "has allowed the United States to increase its oil production faster than at any time in its history," the EIA said in recent report. U.S. output has nearly doubled over the past decade and America only trails Saudi Arabia and Russia globally. That surge in American crude is one of the main reasons why there is a global glut in oil that keeps getting worse. The excess supply caused oil prices to peak in mid-2014 and crash as much as 75% since then. "Prices are where they are because shale has been so phenomenally successful. It's changed the whole pricing paradigm," said Tamar Essner, director of Nasdaq's energy team. So how does fracking work? Fracking involves shooting a mixture of mostly water and sand under high pressure against a rock formation until it fractures. The sand fills the fracture, forcing crude oil out of the rock formation. Fracking has been criticized for its potential environmental consequences, including water contamination and earthquakes. These concerns were summed up in a 2010 HBO documentary called "Gasland" that focused on communities impacted by natural gas fracking. 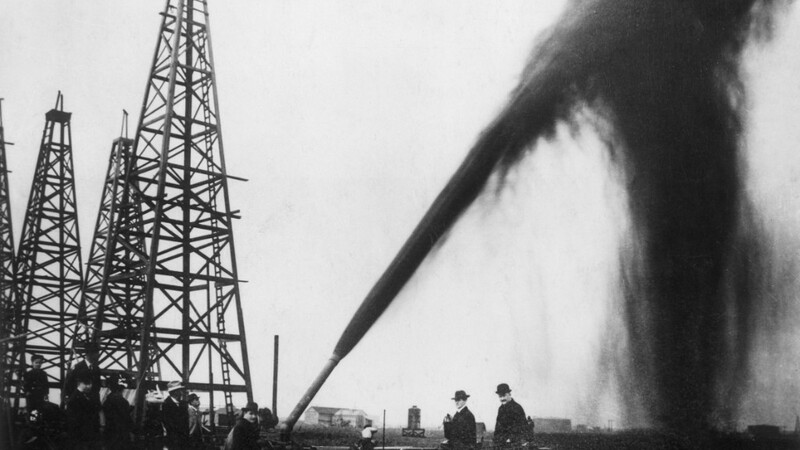 Shale oil is not a new discovery. It's actually been around for 60 years. What's new is that the technology has vastly improved in recent years. Innovation has made previously-expensive fracking much more efficient. High oil prices before and after the Great Recession lured tons of investment dollars into this space, fueling a technological revolution. Investors were also motivated by extremely low interest rates to borrow cheap and invest in this technology. The fracking revolution first hit the natural gas space, fueling a wave of production in giant shale fields such as the Barnett and Marcellus spread across Texas, New York, Pennsylvania and Ohio. But a supply glut quickly formed in natural gas, causing prices to crater. Fracking then spread to shale oil fields, led by the Eagle Ford and Permian Basin of Texas and the Bakken formation of North Dakota. This turned out to be a game changer because it brought about a ton of new supply that was cheaper to drill than deepwater projects or even the Canadian oil sands. "The incremental amount of new supply was really underestimated. I don't think any OPEC member took shale seriously until maybe two years ago," said Essner. The other game-changing characteristic of fracking shale oil is how fast the entire process is. While deepwater production in places like the Gulf of Mexico require tons of lead time, shale wells can be drilled and start pumping oil relatively quickly. The "fast-cycle" nature of shale is one of the reasons many believe the days of $100 oil are gone for now. Lately, shale drillers have dialed down pumping and U.S. oil output has declined a tad in recent months because oil prices fell as low as $25 a barrel. However, everyone expects some of these oil fields to be easily switched back on the minute oil prices hit levels where they can make money. For some shale oil fields that price can be as low as $40 a barrel. "It puts a ceiling on how far and how fast prices can go up," Essner said.